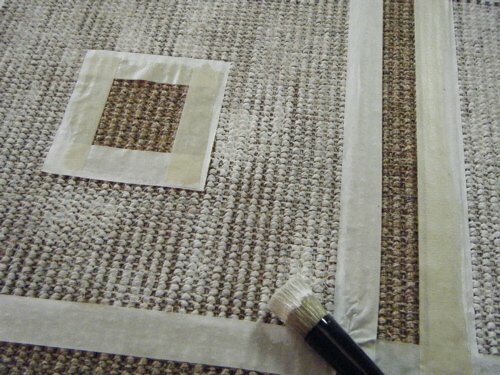 I have seen many photos of painted and stenciled sisal rugs and read many “how to” articles, but it was not until just recently that I actually tried doing a project. A client asked if I could paint a geometric design she had seen in a magazine. I read up on the technique and materials used, and thought I’d give it a shot. 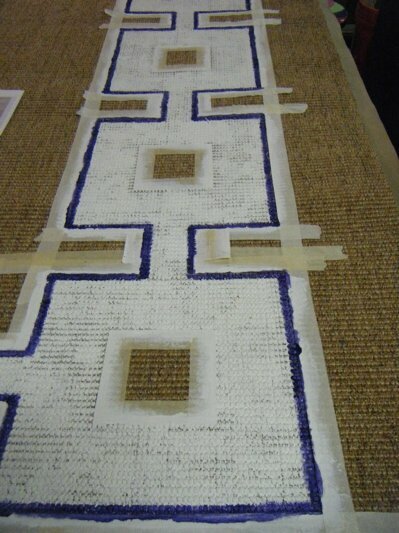 Since the rug had not been purchased yet, I asked my client to get a tightly woven sisal rug. 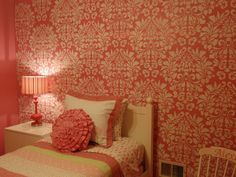 Hers was purchased at Pottery Barn. I graphed out my design on paper before I began this process. 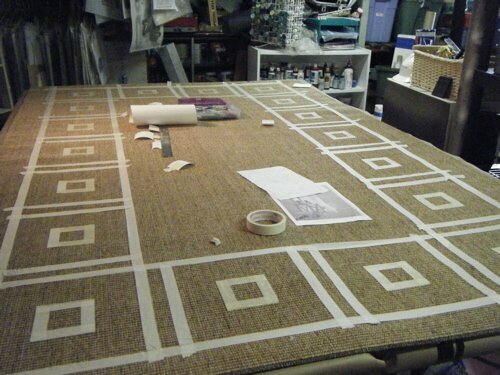 In my studio, I was able to push two tables together that were big enough to hold the rug. Using masking tape, I then measured and taped out my design. I was only working with two colors, white and navy blue. I did all the white first. Well, this was not as easy as I thought it was going to be! I first tried using a stiff stencil brush to apply my paint, but it was not covering well. For my second coat, I used a small, fluffy roller and that gave me better coverage. I did end up doing 3 coats of the white to get the coverage I wanted. Next came the navy blue. Darker colors definitely cover the sisal better. I did 2 coats of the blue. Now you see the rug has really shaped up. I had very little bleeding under the tape. What little I had, I gently scraped off with an Xacto knife. 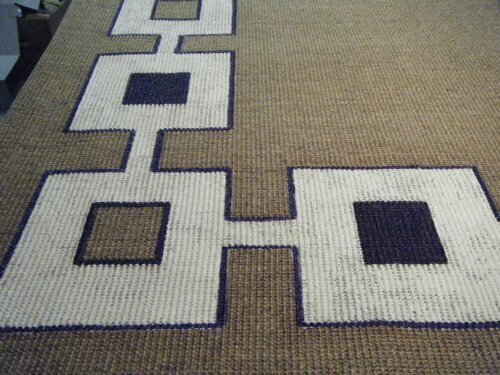 I think the key with stenciling or hand painting these sisal rugs is to choose a geometric design. 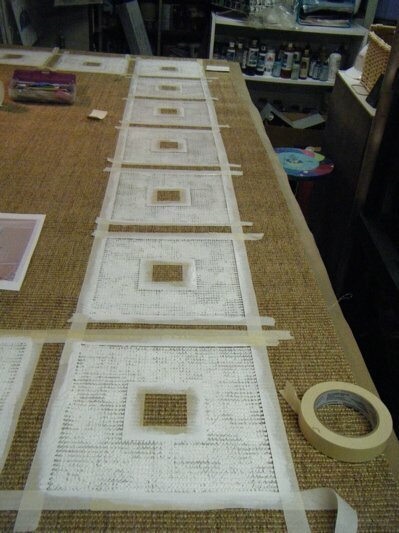 That way, you can follow the rows of the sisal for your guide. It would be much more challenging to try to do curved or detailed designs. I’m not saying it can’t be done, because I’ve seen some beautiful ones! I’m just saying you better be up for the task! Here you can see the pattern a little closer. I sealed the rug with 3 coats of Krylon Clear Acrylic Sealer in a Satin finish. Finished project looks great! I stumbled upon the article after realizing that the only way I will get a rug that will fit my living room (10 x 12) that is both stylish and affordable… is to decorate it myself. Maybe this is a dumb question, but I was wondering whether you sprayed the sealer on only the painted portions, or if you sprayed the whole rug? It the former, were you careful to only spray the painted portion? I guess I’m concerned that the sealer may effect the coloring/texture/appearance of the rug. Julianne, I sprayed the sealer on the entire rug, because I felt it would hold up better to stains. It’s going in a foyer and there are small kids running about with muddy/dirty shoes all the time. 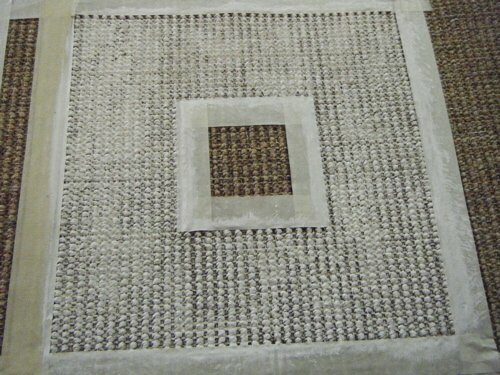 The sealer did not change the color of the unpainted sisal at all. If your rug is very light, it may darken a bit. This rug was a medium tone. It takes several layers to get good coverage with the paint, but the end result is worth it. I’d love to see a pic of yours when you do one! Thank you so much for responding… I wasn’t sure if I would get a response since the post was from November 2009. 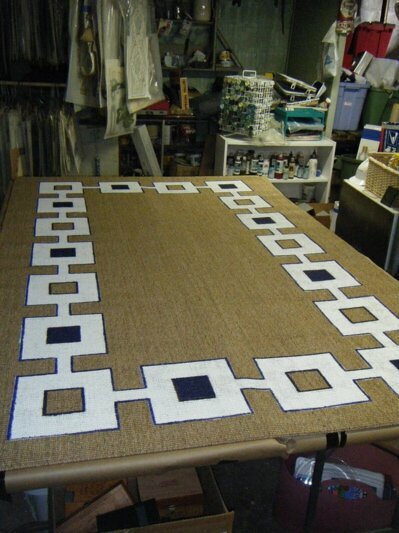 The finished product is still a while away as I’m in the process of buying a sisal rug from Overstock and am looking for stencils and patterns. Hope to have it done in the next month or so and I will definitely share the final result with you. Was the paint you used latex or oil based on the Sisal rug? Diana, I used acrylic paints and find Golden’s Titanium White to be one of the best whites for a good, opaque coverage. 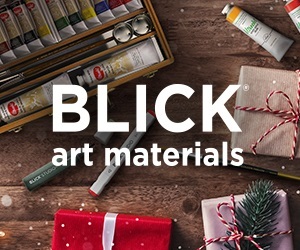 You could use any latex or acrylic paint. I would not get into oils because they are just too messy.